Israel, Palestinians Further from Peace After US-Brokered Talks? US-brokered Israeli-Palestinian peace talks are on the brink of collapse after nine months of rather fruitless negotiations, and the Obama Administration appears ready to throw its hands in the air in defeat. "You can facilitate, you can push, you can nudge, but the parties themselves have to make fundamental decisions and compromises," US Secretary of State John Kerry, the main facilitator of the talks, told reporters in Algeria on Thursday. At Kerry's instruction, US envoy Martin Indyk held an eleventh-hour meeting with Israeli and Palestinian negotiators in Tel Aviv late Wednesday night. But reports were that the gathering was very stormy, and only served to highlight the vast gaps and outright hostility that continue to divide the two sides. 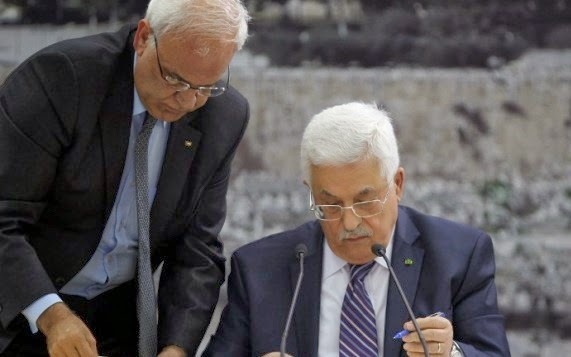 According to the Palestinian news agency Ma'an, chief Palestinian negotiator Saeb Erekat opened the meeting by informing his Israeli counterparts that he was representing the "state of Palestine," and not a mere political entity granted authority by Israel. That greatly angered chief Israeli negotiator and Justice Minister Tzipi Livni. Erekat's boasting came a day after Palestinian leader Mahmoud Abbas signed 15 treaties in a new effort to gain official recognition for Palestinian sovereignty from the international community. The UN's special envoy on Mideast peace, Robert Serry, confirmed that his office had received at least 13 official requests from the Palestinians to join various international conventions and treaties. Prior to Wednesday night's meeting with Erekat, Livni insisting that the Palestinian Authority had violated its primary commitment in the peace process by seeking recognition outside of a bilateral agreement. "The PA has breached its obligations by applying to the UN," said Livni. "If they want a state they need to understand that it will only be established on the negotiating table." Livni went on to call the situation "complicated," and urged Israel to maintain the moral high ground by remaining at the negotiating table, even if its transgressive "partner" walks away. Abbas initially threatened to launch what the Israelis are calling a "diplomatic intifada" if Kerry couldn't get Jerusalem to carry out the fourth agreed upon prisoner release by the middle of this week. Israel committed to four prisoners releases when US-brokered peace talks began nine months ago. But the Palestinian leadership has since indicated that it is only remaining at the negotiating table in order to secure the terrorists' freedom. As such, Israel has been reluctant to carry out the fourth release if there will be no benefit to the peace process. The Obama Administration, meanwhile, tried to draw a bit of moral equivalency between the two sides, suggesting that the construction of 700 new apartment units in the Jerusalem neighborhood of Gilo was equally egregious as Abbas' maneuvering at the UN. "Unhelpful, unilateral actions both parties have taken in recent days" are jeopardizing progress toward peace, stated White House deputy spokesman Josh Earnest. Israel, of course, has never agreed to negotiate control of Gilo or any other Jewish-dominated part of Jerusalem, nor do the various existing agreements prohibit Israel from building there. US lawmakers weren't buying the White House's attempt to downplay the Palestinian Authority's violation. At a meeting of the US House of Representatives Appropriations Committee, American Ambassador to the UN Samantha Power was told that the Obama Administration must make absolutely clear that Abbas' scheming is unacceptable, and that it could cost the Palestinians' any further US financial aid. "The Palestinians applying to the UN breaks all the rules, and we have to respond in kind—by canceling the Oslo Accords, which have only brought terror and murder. The Palestinians have proven once again that there is no reason to give them false gifts, and release terrorists and murderers for a process whose conclusion is well known in advance."